The offer is to provide the majority of the estimated $400 million capital needed to build a 4-lane tolled Penlink road – including bridge over the Weiti River, busway, cycleway and possibly park-and-ride – recovering all revenue on an extended concession and transferring back to Auckland Council for free at the end of the concession. Below are some thoughts about this, in no particular order. creates a shortcut to the Northern Motorway and does nothing or even makes worse the motorway traffic south of where the road would join in. Auckland Transport are currently running their trial of dynamic lane marking and have been saying they’re seeing positive results. It would be useful to better understand the impacts of that before jumping into a $400 billion solution. It will be interesting to see how they make the predicted vehicle volumes stack up. In 2046 daily usage is expected to be just 16,800 vehicles per day, and even with a $3 toll, isn’t likely enough to support operational costs and loan repayments. I don’t have a problem If a private company wants to finance Penlink and pay for it with tolling. What I am concerned about is the comment from Barnett that the funding only covers the majority of the cost. That means there is still an expectation the council and/or government would fund some of the project, in which case I believe it still needs to go through our normal prioritisation processes. That’s because any money the council and/or government have to contribute for their share is money that can’t be used for other projects which may otherwise be more valuable. The same goes for actually building the project as any work will take up construction resources and capacity that might make other projects more difficult and costlier. This isn’t the first the I’ve heard about unsolicited bids for transport projects. There are a few others I’ve heard of this year already, both publicly announced ones like the NZ Super Fund bid for light rail but also some private bids too. None have currently been accepted. The point being that it’s no guarantee this one will be accepted either. If we’re going to build Penlink, part of the deal should also be about allowing more development in the area. Currently there is very little growth allowed. Below are a few reasons these numbers are bizarre. Even in 2046, the only way to get close to 50k vehicles per day is through the untolled version (46,300). With a toll that number is even lower at 33,600 per day. The NZTAs motorway data shows 38k vehicles use the ramps at Silverdale with most (about 32k) using the south facing ones. And finally the chestnut of a 2 or 4 lane road. The actual original plan was a 2-lane road, it was only expanded to 4-lanes in 2015. Earlier this year I looked at the question of a 2 or 4 lane road and found many 2-lane roads carrying far more vehicles per day than Penlink is ever expected to. There’s also likely to be a major issue where the two lanes of Penlink try and join the two lanes of the Northern Motorway. Then what??? There is NO answer to too many tin boxes on that road that does not include billions of dollars. +1 for content and +1 for humour. The reason Penlink shouldn’t be a PPP is that it shouldn’t be built at all. It’s not just because it would take some public money and it would starve other projects of building contraactor availability. It’s because it will encourage more driving, and we shouldn’t be doing that at all. If any link should be put through there, it should be entirely for buses and active modes. People would then be given some real transport choices. There’d be mode shift and carbon emissions reductions and better access, with lower travel times. But that would have a big cost; I don’t think it would compare well with other projects to achieve the same goals. 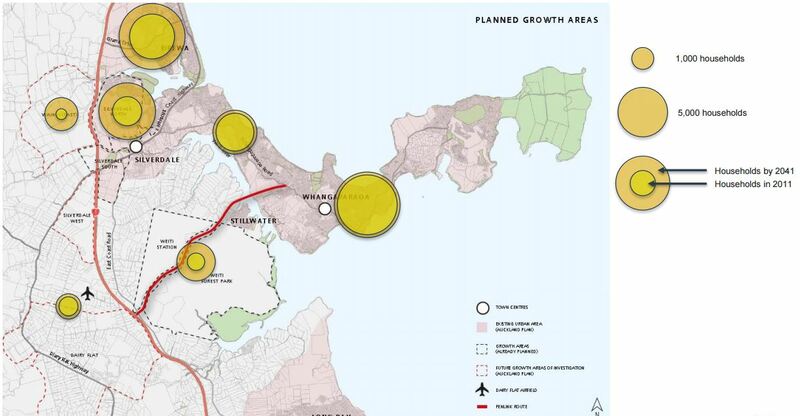 At a minimum, to justify taking money from NZ’s transport coffers – whoever funds it – Whangaparaoa would need to allow intensification on its existing footprints. Hmmm. I wonder what an LRT/Emergency Vehicle Penlink only would look like in terms of cost and spec. Of course, you don’t get the ongoing revenue of a toll road to go with it, and you’d have to budget for an LRT loop around the Peninsula, but something highly visible like that would probably help with local buy-in for density. LRT over the harbour bridge to end with a loop at Whangaparaoa? That would be luxury, eh, but the mad thing is the likely local resistance, despite how fantastic it would be. I wonder if the locals realise how many day-trippers would come to Whangaparaoa if Penlink was a road. All un-modelled, of course – it’s one of the many, substantial, forms of induced traffic NZTA ignores. A complete LRT network would mean I could leave my car at home in West Auckland, LRT to Constellation and then up to the Hibiscus Coast to visit family. This is what NZTA needs to be selling people, not “TRAMS TO THE AIRPORT AND THE AIRPORT ONLY”. 100% yes to the above, we should be cracking on with LRT all over Auckland instead of just the airport. That peninsula is suffering from severe car-dependency imposed by AT, who provide half-hour gaps between buses combined with a very dangerous road. Proper bus reach and frequency is probably the immediate and easy fix, with a plan for Auckland-wide LRT stations to follow quickly behind. What is certain is that the answer ain’t to build another road! absolutely right that there should be light rail to the Shore and work could start on it tomorrow if the sort of creative funding solutions that have been advanced for Penlink and airport rail are considered. The Harbour Bridge was paid for by Shore residents and it is reasonable that Shore residents again pay for a light rail link that will not only provide this transport solution, but forever free the existing bridge for vehicle traffic. In the Barnett book socialism is when the government hands money to poor people, capitalism is when the government hands money to rich people and corporations. Socialise the costs, privatise the profits. Neoliberalism at its very best. Why is Barnett so fond of this particular project? Does he live in gulf harbour or something? Penlink will only ever be economic with long term tolling. And I don’t think it needs to be 4 lanes either. I’d have no problem with a PPP so long as there is absolutely no cost or risk to the council or government, and there was ramp metering at its connection to SH1 favouring SH1 traffic. If there are 32k using the south facing silverdale ramps, only a portion of this traffic will shift to a toll road, say 25k. I don’t think this would be enough to pay for it, given the northern gateway toll is $2.30 and this would logically be less. Is it still called a PPP under those conditions? No cost to the government – does that mean no lost opportunity cost to do something else in the same location, ie they have to pay for the land, too? Opportunity cost in construction industry not being employed elsewhere? yes and all of us on tank water in Stillwater just what we need more fumes driving past! I think it’s still a PPP? The government has designated the corridor and would have to acquire land by negotiation or failing that the public works act (which I don’t think the consortium could do?). Then government needs to transfer right to develop toll road to consortium for a set period, say 40 years, after which operating rights transfer back to government. So definitely some public involvement. Unless I’m misunderstanding how these things work? Be good to know where the people who would use pen link if built are going to. Then would could see how well PT would serve them. Other option is to set high price eg. $5;to fund better/ cheaper PT. Can imagine how the population density of the peninsula could grow? Is there likely to be multistorey housing developement and apartments. Is the Defence land likely to be sold off? What does Mr Barnett know that we don’t? What would be the comparative cost of making the existing spine road multi lane? how will it cope with the demand for the 50,000vpd that will use Penlink? In the traffic modelling report, it’s interesting that they chose not to use the usual Auckland-wide regional forecasting models that AT had specified be used, because they found they didn’t look realistic for the area, showing a decreasing population at Whangaparaoa. They used the Rodney District Council models instead, with some updates. Apparently AT also looked at widening Whangaparaoa Rd, between Hibiscus Coast Highway and Red Beach Rd, and if that work was included, it would “reduce the economic efficiency of the [Penlink] project as measured against the no-Penlink scenario”. The modelling uses the usual erroneous assumptions that make doing nothing look super bad, but in addition to that, I smell a pretty rotten development rat in this area. I imagine we’re going to see low-density, car-dependent sprawl into farmland and very little medium density lower-impact development. And therein lies the problem; the lack of coordination between land use planning and transport. The traffic modelling is a joke, as usual, with enormous travel times being shown for the “No Penlink” option, again because the number of person-trips that undeveloped option is set as equal to those that would be served by having Penlink in place. Madness. I wish I had time to delve deeply into some research I’ve found into the vested interests who seem to influence the zoning in the area. Same old, same old, I suppose. I think Matt’s suggestion that Penlink “makes worse the motorway traffic south of where the road would join in” hits the nail on the head. This highlight’s NZTA’s lack of consideration of a project’s induced traffic and its network-wide effects. Build another park and ride in Whangaparaoa and make it cheap to travel on bus 40 people on one bus equals at least 20-30 less cars on the road !! Yes, encouraging people onto the bus through good services and cheaper fares makes complete sense. The cost to society of each person on a bus is way lower than if they take a car. I don’t think you’d need or want a park and ride facility though – it would take a lot of money and land, and people haven’t shown they are prepared to foot the fee to cover this cost. It also creates a blot in the urban fabric, a severance between interesting places, and a whole lot of car infrastructure for people walking and cycling to have to negotiate. Instead, most people would be able to walk, scooter or bike to the bus, as Whangaparaoa is blessed with a skinny shape so most people will be within a few hundred metres. The people who can’t manage the whole way could drive part of the way and park on a side road. This dispersed parking would be far less disruptive than a park and ride.